The latest Best Law Schools ranking released today by U.S. News & World Report recognized three University of Akron School of Law programs as among the top 50 in the country – and best in Ohio – in their respective specialty areas. The Intellectual Property Law program tied for No. 41 with six other schools. Trial Advocacy tied for No. 34 with eight other schools, including Harvard University. Our Part-time Law Program tied for No. 37 with two other schools. In each category, Akron Law was ranked highest (or tied for highest) among Ohio law schools. 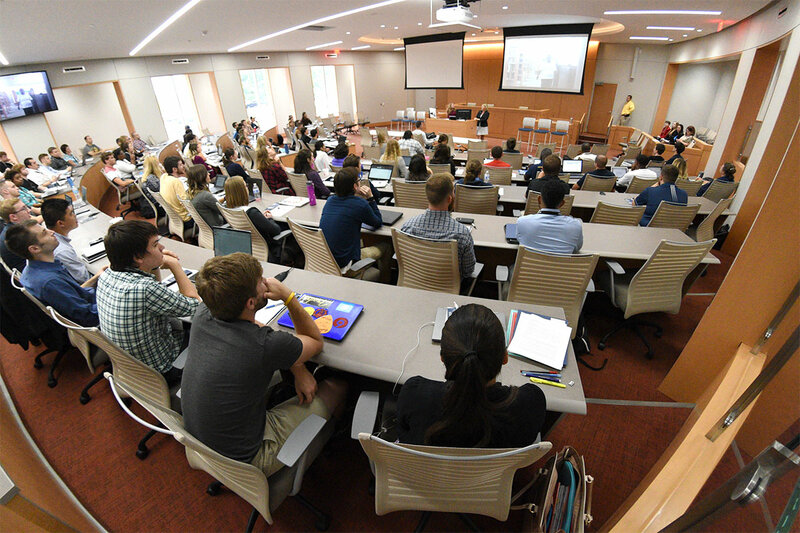 The David and Ann Amer Brennan Courtroom was part of a recent $21 million renovation to the McDowell Law Center on the University of Akron campus. For more about the national profile of our Intellectual Property (IP) program, read about last week’s 2019 IP Symposium. Our Trial Advocacy teams continue to be nationally ranked. Meet the school’s Mock Trial and Moot Court teams for 2019. Learn more about our Part-time Law Program. For more information on the methodology, see the U.S. News website.